The content delivery network market (henceforth referred to as CDN) was valued at USD 7.33 billion in 2017, and is expected to reach a value of USD 29.48 billion by 2023 at a CAGR of 26.1%, over the forecast period (2018-2023). The scope of the report is limited to products offered by major players.The end users considered under the scope of the report include media and entertainment, advertising, e-commerce, healthcare, business and financial services, research and education. With the presence of the CDN market leaders in the region, North America is expected to dominate the market, overthe forecast period. Media content delivery held the major share among content network delivery solutions. Many organizations are adopting various video CDN platforms for sharing their promotional videos and media with their customers. Rising demand for rich video content among the increasing online users and the trend of digitization among the organizations across the end user verticals, boosts the overall CDN market demand. According to Cisco’s visual networking index, IP video is projected to have 79% of the traffic by 2018, which indicates the growing trend of online video services. With the advent of 4K/UHD televisions, high definition supporting smart gadgets and improving connectivity are rising the expectations among the viewers for high quality content. Hence, scalable deliverable capacity and optimized storage mechanisms are becoming more essential for the CDN vendors. The number of internet users have increased by nearly 10 times when compared to the past decade. The total world population using internet stands at 51.7%, which is responsible for the growing online content. Many gaming services have been adopting online channels for delivering content to the users, which has further enabled the growth of CDN market. One of the major companies, Cisco, has also predicted that the amount of internet traffic is expected to increase by fourfold, emphasizing the need for content delivery networks. It has been identified that 68% of the consumer traffic has been made up by video services, which is expected to rise to about 82%. Media Delivery is Expected to Have High Market Share. Rising demand for rich video content among the increasing online users and the trend of digitization among the organizations across the end user verticals, boosts the overall CDN market demand. Online gaming is one of the major areas where CDN is gaining prominence. The gaming companies are increasingly investing in CDN to deliver high-quality content for ensuring better user experience. Many media organizations are making a transition toward digital distribution model. These transitions present a great market opportunity to the CDN vendors. CDN vendors are increasingly focusing on the techniques for web performance optimization, in order to cater the mobile and dynamic content requirements. The amount of mobile traffic for media-related services accounted for about 45%, which is further expected to increase. The need for content to be mobile-compatible is further expected to increase, owing to the expected growth of consumed data to about 4.5 GB per month, which is now at an amount of 900 MB on average. North America Has the Largest Share in Content Delivery Network Market, Owing to the Prevalence of Various Services. North America has a high internet penetration rate, which is expected to aid the growth of content in that region. With the presence of the market leaders and early adoption of technologies across various end-user verticals, North America stood as the leading regional market and is expected to continue its dominance, overthe forecast period. The number viewers for online gaming content has also been increasing consistently. 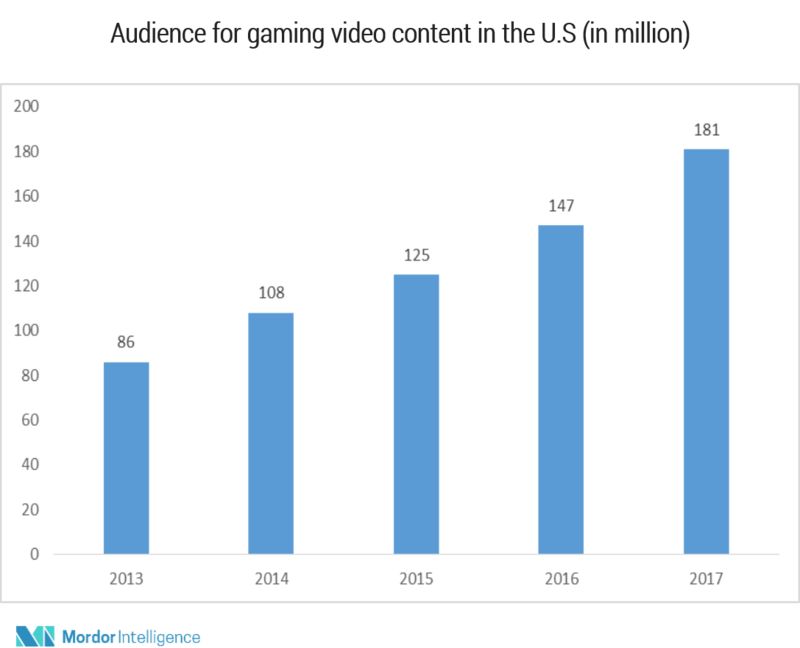 The growth of gaming video content has also been increasing, which is further contributing to the growth of CDN around the world. In the United States, the usage of Paytv has also been reducing and increasing number of consumers have been identified to prefer online media content to Paytv. Off late, cord cutting has been accelerating and about 22.2 million cord cutting are expected to be done in the coming years, emphasizing the shift toward on-demand content. February 2017 - Amazon web services has continued its plans for expansion, as a new data center has been planned in a 44-acre space in the Loudon data center campus. Amazon has further planned on expansions in this area. November 2017 - Companies, such as Edgemesh, have joined Google cloud technology, which has further added about six new locations for the delivery of such application services. Google has also enabled Edgemesh to increase the amount of traffic experienced by the company.